The three-member crew will spend six hours en route to the ISS, where they will join three others already aboard. Launch day is here for three new crew members of the International Space Station, and you can watch the liftoff live right here at 11:41 a.m. EDT (the live coverage is scheduled to begin at 10:45 a.m. EDT). 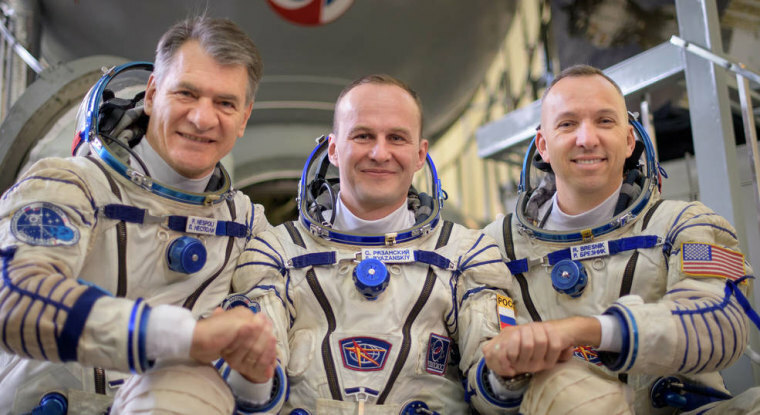 Aboard the Soyuz rocket will be NASA astronaut Randy Bresnik, along with Russia’s Sergey Ryazanskiy and Paolo Nespoli of the European Space Agency, NASA said in a statement posted on its website. The rocket will lift off from the Baikonur Cosmodrome in Kazakhstan for the six-hour trip to the ISS, where the trio will be greeted by three crew members already aboard the ISS: NASA astronauts Peggy Whitson and Jack Fiischer and Russian cosmonaut Fyodor Yurchikhin. The six crew members will spend more than four months aboard the ISS conducting experiments in biology, biotechnology, physical science, and Earth science.